Summary: Eleven Madison Park is one of New York City's most popular fine-dining establishments, and one of only a handful to receive four stars from the New York Times. Under the leadership of Executive Chef Daniel Humm and General Manager Will Guidara since 2006, the restaurant has soared to new heights and has become one of the premier dining destinations in the world. 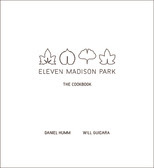 ELEVEN MADISON PARK THE COOKBOOK by Daniel Humm and Will Guidara is a pretty impressive cookbook. It is an over-sized book with a stark white cover and silver text, and it weighs a ton (not literally, of course, but it is really heavy!) I guess that quality of the cookbook fits with the reputation of the restaurant Eleven Madison Park. This restaurant has received so many accolades -- from a four star rating from the New York Times, to the James Beard Foundation's Outstanding Restaurant Award for 2011, to one of the World's 50 Best Restaurants according to San Pellegrino's list. I was blown away by ELEVEN MADISON PARK THE COOKBOOK for a number of reasons. There is no doubt that this is one special cookbook. However, I am going to be totally honest with you here. As impressive as this cookbook was to me, it's not one that I will be using on a day-to-day basis. In reality, it's most likely one from which I will never make a single recipe. But it sure is a beautiful cookbook to explore for food lovers like me. ...the question that has come up most frequently is "Will people actually be able to cook from this book? The simple answer is yes-ish. If you never cook, this is probably a book that should stay on your coffee table. Many recipes require a significant time commitment, a certain level of skill, a reasonably equipped kitchen, and a healthy dose of persistence." The first part of the cookbook is used to introduce the executive chef Daniel Humm and the general manager Will Guidara. There is also some history about the restaurant which I found very interesting. Needless to say, I'm now dying to visit Eleven Madison Park. I'm sure it's a once in a lifetime culinary experience! Then it was on to the recipes for me! The cookbook is divided into sections by the seasons -- Spring, Summer, Autumn, and Winter. There are a wide variety of recipes for each season as well as absolutely amazing photographs. It probably goes without saying that recipes are pretty frou-frou (or at least for my family's tastes) and some are extremely time consuming and labor intensive. But the pictures speak louder than the words -- and these dishes look wonderful. I did find a few recipes that I would be willing to try and probably able to make, although ELEVEN MADISON PARK won't ever be my go-to cookbook. Even if I did attempt to make a recipe from this cookbook, I have a feeling that I would be disappointed because they is absolutely no way that my finished product would look anything like the restaurant's. The presentation is exquisite! Another really interesting part of ELEVEN MADISON PARK was the section that showed "A Day in the Life" of the restaurant. These pages gave an hour-by hour (actually half hour-by-half hour) account of what occurs each and every day in the restaurant as the workers prepare for the customers. I was kind of surprised to learn that it's a 24 hour operation by the time you take into account the prep, service, and cleanup. If you enjoy looking at cookbooks (and for those of you out there like me, you know exactly what I mean), then I highly recommend ELEVEN MADISON PARK THE COOKBOOK. This is truly one of the highest quality cookbooks that I've even seen, and I think it would make a terrific holiday gift for the food lover in your life. This cookbook was a win on Twitter -- and it was autographed! I think this one would be too sophisticated for me also! This cookbook is gorgeous, but I don't think I'll be cooking from it soon either. 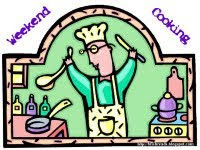 This would be a perfect book for the gourmet cook in the family or just someone who likes beautiful coffee table books. This looks like one of those cookbooks I'll only be reading. But that's okay as I enjoy that as well. I'm intrigued by their half-hour by half-hour timetable. Interesting. I think I'd enjoy the "Day in the Life" part of the book. If my library gets this book, I'll definitely bring it home to read. i have a few cookbooks that I have enjoyed for their techniques only and not made a recipe from them and I'm ok with that.